Evie's eye turn has been getting a bit more pronounced. Her eyes switch off to turn in towards her nose most of the time. This is called intermittent alternating esotropia (if they turned out, it would be exotropia). My initial post about eyes is here. She also has huge epicanthal folds, which is basically the extra skin that covers the nasal corners of the eyes, and can make an eye turn, known as strabismus, look larger than it is. I was hoping she would grow out of it, but my observations were confirmed at her last ophthalmology visit. The size of her eye turn had doubled in the last 8 months. I could have brought prism bars home from work to measure them, but there's just something about doing an exam on your own kid--I am too biased and emotionally involved to do it myself. 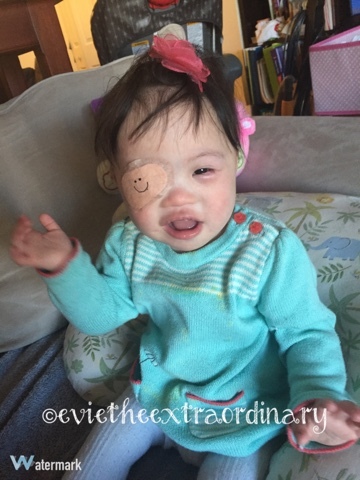 Here is Evie with an eye patch! We are doing it every 30 minutes on her right eye, because her left eye is the one that turns in more often. If we teach the left eye to be used more often, we can hopefully make both eyes more equal in use. Both eyes have the same vision, which is a good thing. Evie doesn't like her eye patch, but she doesn't struggle against it as much as before (she gets to use the iPad or read books with Daddy as a reward). You can get regular size patches or junior size patches. The ophthalmologist gave us a tip that the junior size patches sometimes takes the baby's eyebrow hairs with it. She suggested cutting the regular size to a smaller margin around the edges, and also sticking the patch to our clothes a couple times before applying it to Evie's face, so it wouldn't stick as hard. The winning combo was a bigger patch with the margins cut down, and not sticking it to our clothes. Evie seems to tolerate this well. 30 minutes seems like not too much, but it's eternity when the baby is cranky and trying to rub her patch off her face! 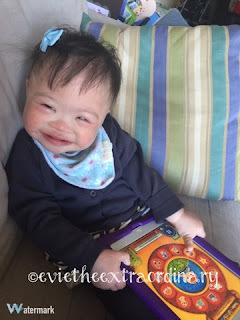 Eventually, Evie will need corrective eye muscle surgery. Generally, they try to do surgery for large amounts of strabismus before age 2 to increase the chance that the baby's 3-D vision will develop at a basic level. However, the ophthalmologist told us that even if this is done before age 2, the chances of developing good binocularity are low. Given that Evie has Down Syndrome and it's a risk each time she's put under anesthesia, she wants to wait until after age 2 to consider surgery, and to combine it with any other procedures that may need to be done. I'm ok with waiting and letting a full year pass from Evie's heart surgery to try another surgery!